Scientists are driving three-wheeled, single-molecule “nanoroadsters” with light and, for the first time, seeing how they move. The Rice University lab of nanocar inventor and chemist James Tour synthesized light-driven nanocars six years ago, but with the aid of experimental physicists in Austria, they’re now able to drive fleets of single-molecule vehicles at once. 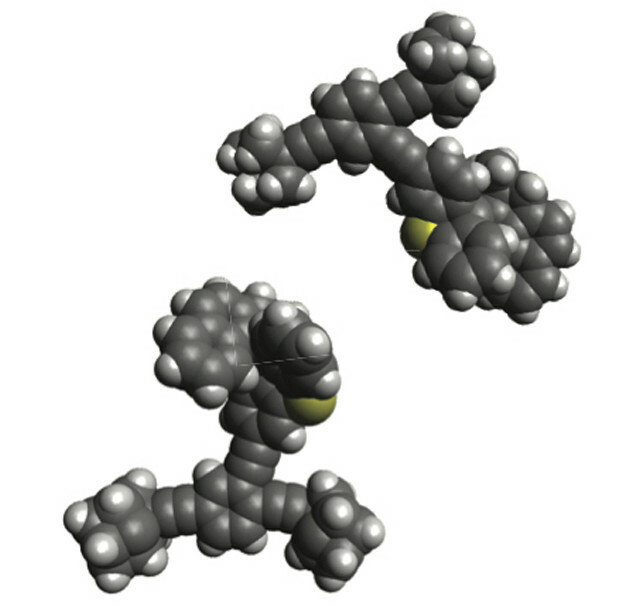 Computer models show two possible forms of the single-molecule, three-wheeled nanoroadster. Rather than drive them chemically or with the tip of a tunneling microscope, as they will do with other vehicles in the upcoming international NanoCar Race in Toulouse, France, the researchers used light at specific wavelengths to move their nanoroadsters along a copper surface. The vehicles have rear-wheel molecular motors that rotate in one direction when light hits them. The rotation propels the vehicle much like a paddle wheel on water. The team led by Tour and Leonhard Grill, a professor at the University of Graz and formerly at the Fritz-Haber-Institute in Berlin, used wavelength-sensitive modified motors invented by Dutch scientist Bernard Feringa, who shared this year’s Nobel Prize in chemistry for his molecular machine. Grill says remote control by light eliminates the need for a local probe that would have to address the molecules one by one. “Additionally, no ‘fuel’ molecules are required that would contaminate the surface and modify the diffusion properties,” he says. Tour has used modified Feringa’s motors to power his lab’s nanosubmersibles. In this case, the motor is the back wheel. He says the three-wheeled configuration simplifies its use because larger nanocars are more difficult to put onto an imaging surface and often dissociated during deposition under vacuum, according to Grill. Experiments by lead author Alex Saywell of the Grill group on nanoroadsters made at Rice demonstrated a need for a fine balance of light and temperature to allow “enhanced diffusion” of the molecules in a vacuum. Grill says using light to drive nanomachines offers a fundamental advantage—the ability to selectively induce motion because of the motors’ sensitivity to wavelength. Ultraviolet light at 266 nanometers doubled the roadsters’ movement compared with “control” roadster molecules without motors. At 355 nanometers, it tripled. The roadsters, made of 112 atoms, reached a top speed of 23 nanometers per hour. A surface activation temperature of 161 kelvins (minus 170 degrees Fahrenheit) proved best for driving conditions. If the temperature is too cold, the roadsters would stick to the surface; too warm and they would diffuse randomly without help from the motor. “We were surprised by the very clear correlation of the enhanced motion to the presence of the motor, the need for both heat and light to activate this motion—in perfect agreement with the concept of the Feringa motor—and the wavelength sensitivity that nicely fit our expectations from spectroscopy in solution,” Grill says. A report on the work appears in the journal ACS Nano. Additional coauthors are from the Max Planck Society in Berlin. Saywell is now the Marie Curie Research Fellow at University of Nottingham, United Kingdom. Tour is chair in chemistry as well as a professor of computer science and of materials science and nanoengineering at Rice. The National Science Foundation, the Marie Curie Intra-European Fellowship, and the German Science Foundation supported the research.